Keeping clients engaged is not as hard or as uncomfortable as it may sound. Not even close. If you want to stop working on those "one and done" client projects, then you have to stop being a "one and done" translator or interpreter. Look at every job as an opportunity for an ongoing business relationship. But like all good relationships, you have to cultivate this one. Here are three reasons you ought to be engaging with your clients between your translation and interpreting jobs. 1. It shows that you care about having a lasting business relationship. After all, these are the people who put food on your table. When you engage with a client around the actual paid portion of work, you show that you're worth more than the line item that shows up on their expense sheet. By providing value in more ways than simply handing over the service you provide as a translator or interpreter, you might even be sealing an impression that keeps you on as a contractor for the long haul. People like to do business with people they like and trust. So... help them like and trust you. 2. It helps you to stay top of mind. Even if your client doesn't have a current project for you, he/she can refer you to others who do. These referrals will help fuel and grow your business, too. Never underestimate the power of referrals. When I took a hard look at how much of my business was based on referrals, I was shocked to see it was well over 50%! To learn more about using referrals wisely, check out How to Use Referrals and Grow Your Client List. 3. It allows you to stay on top of the new things that are happening with your clients and with which you might be able to help. I can't tell you how many times I've simply sent off an email to a client to ask how things are going for them only to receive a tidbit of news or a mention of something that truly helps me to understand my client better. Perhaps your client has plans to grow in a new market. Do you translate that type of content? If you don't yet, could you? Or maybe they are planning to cut back on their budget. That doesn't mean you should stop engaging with them, but it does mean that you should plan ahead and perhaps start marketing to more clients in a similar industry so that your income doesn't suffer when you start to see the effects of that client's reduced budget. The information that comes from staying engaged with clients is valuable in so many ways. Don't overlook the possibilities! A lot of us have a less than loving relationship with networking. I'll be honest. I've never really enjoyed it. And while I don't think I'd consider myself a true introvert, I do like to think of myself as a "webtrovert", i.e. someone who feels more comfortable interacting for the first time with clients and leads online rather than in person. It's not that I'm opposed to meeting clients face-to-face. I often do, but ask me to go to a networking event, and I'll probably think of ten other things I'd rather be doing. I don't love to be thrown into situations where I don't know anyone in the room or I think I may not be making the best use of my time. However, if I can take some time to prepare in advance of the conversation, I feel more in control of or like I have more of an influence on the outcome. Of course, there's no guarantee, but I do prefer to feel prepared than caught off guard. My guess is you do, too. So, how do we take the fear or discomfort out of networking and really own the message we want to share as translators and interpreters? My suggestion: online networking… especially because of the industry in which we've chosen to work. As translators and interpreters, we don't always have the ability to meet our clients in person. Some of us work with clients in other states and countries. That's why we sure as heck better know how to effectively networking with them online. Here are my top tips for taking the fear and discomfort out of networking. ● Set up a time to network every day. Yes, every day. Or at the very least, a few times a week. You set the time. Put it on your calendar or in your agenda, and show up for it like you would a meeting with a client. Decide how to best make use of this time by preparing and providing them with value. That value will look different for each of us. That's why it's best to know and understand the needs of your ideal clients. To read more about how to know and target your ideal clients, check out How to Determine and Attract Your Ideal Client and How to Create and Ideal T&I Client Profile to Market Your Services. ● Use this time to interact with your clients or potential future clients. Send some warm emails or engage with them on social media. Give them a call, or send them a handwritten note. All of these things can be done on your own time and do not require you to attend an event or have an awkward conversation. ● Treat your online networking efforts as market research. The more you get to know your clients, the more information you can "swipe" for future marketing campaigns and messaging. To learn more about what "swipe files" are and how they can work for you, check out Why You Need to Keep Swipe Files for Your T&I Business. ● Set aside some time or a specific day each week in which you can meet with your clients virtually. You can easily set up appointments these days with online calendar tools, like Google, Calendly, etc. It's just as important to stay in touch with and meet with current clients so that they know you are available and excited to continue working with them. Tell them what you're working on and ask what they're working on as well. Engage. Engage. Engage. This is not the time to sell. Just engage. ● In advance of the networking session or meeting, take some time to get to know the person you are meeting by looking them up online. See if they have a blog, or published articles, if they've won any awards, if they have been mentioned or interviewed recently. See what they're posting on their social media platforms. Do your homework. A feeling of preparedness will allow you to show your interest in working with the client and will also give you some potential topics of conversation. When you take the time to schedule these things, you will start to see the benefits of networking this way. ● You are in control of the "when" and "where". No longer will you be caught off guard by a direct question from a potential client. ● You can feel comfortable meeting someone from the familiar surroundings of your home office or workspace instead of having to pay $15 to $20 for an event and trying to juggle finger foods, a drink and hold an intelligent conversation. ● You can easily schedule your work around these networking sessions because they are short, focused and you won't be spending valuable time driving to and from an event. ● You are able to make sure that you meet with someone who you actually have a desire to do business with, and not just the person who ends up standing next to you in the buffet line at a large networking event. This type of networking allows you to be strategic. ● You can continue to get to know your clients and hone your message. Practice makes perfect, right? The more you take the time to network online with your clients, the better you will get at it. It will no longer feel like an uncomfortable task to help you market and grow your business. It will simply be a part of doing business. Don't like the idea of a virtual session? Pick up the phone. Prefer to meet the client in person over a meal? If they're local to you, schedule it! Once you are able to comfortably network with clients on your terms, whether virtually or in person, you can really craft and refine your message so that marketing and networking become second nature. See what works for you and what doesn't. And go from there. Networking doesn't have to be something that makes your hands sweat just thinking about it. It can be fun to do the research to get to know a client better before you have that first conversation. It also helps your clients get to know you better and trust you. After all, people like to do business with people they like and trust. Own your networking skills. Own your message. Grow your business. To read even more networking tips, check out my Seven Tips for Effective Networking When You Work from Home. It's no secret that if you want to stay in business, you have to get paid for the work you do. Not just get paid. You have to get paid on time. If you can't pay the bills, your vendors, or yourself and make a profit after all your expenses are paid, then you can't expect to stay in business for very long. So how do you make sure to keep the cash flow moving? By applying a few simple strategies today, you can stop chasing down those delinquent clients and start focusing on growing your business. We've been implementing these strategies in my business for years, and we generally do not have problems with clients paying late. 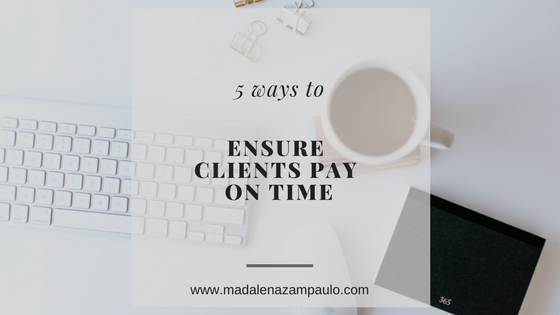 The ones that continue to pay late after we've made sure to follow through with these 5 strategies do not remain clients. It's pretty simple, and it's totally not personal. It's business. I don't know about you, but I think we all wear enough hats in our businesses that adding "Collections Agent" is not a position we want to add to our resumes anytime soon. 1. Say it up front. Make sure that your payment terms are in your proposal/quote AND in your contract underneath the total amount your client will be expected to pay. If you want to ensure payment within 30 days (NET 30) for example, then specify that the client's payment is due NET 30 once they receive the final deliverables and invoice from you. If your client signs on the dotted line, they have accepted your payment terms. Tip: Let your client know in the contract exactly how they can pay you. Do you accept credit cards payments, PayPal or checks? If you want a check, let them know where to send it. Another form of payment? Let them know! Here's an example of how we spell out our payment terms in my business. 2. Use a smart invoicing system. What do I mean by smart? I'm talking about an invoicing system that allows you to receive payment once the client clicks on a link in the invoice you sent. Often, you can find one that connects to QuickBooks or another accounting software as well. And if you really want to use a smart system, I highly recommend using a service like HoneyBook. In fact, the screenshot above is directly from our HoneyBook system that we use with all our clients. Clients can pay by clicking on a link, and you can actually see when they viewed your invoice. No more wondering if they even received it! In my business, we have it set up to send clients a 3-day reminder before payment is due. This system has worked beautifully for my company, and as it turns out, many of our clients are actually paying as soon as they sign the contract. What more can you ask for? This might sound a little harsh, but when it comes to getting paid on time and whether or not you can pay your bills, you better mean business. No pun intended. What kind of late fee should you charge and how do you enforce it? In my business, we charge a percentage of the overall project cost for every 5 days the payment is overdue, and I can tell you that for all the years I've been in business, very few clients pay late! Make sure the late fee is spelled out on the proposal/contract. Again, scroll back to the screenshot and see exactly how we let clients know about late fees. Reiterate the late fee on the invoice once you deliver. If worse comes to worst and your client's payment is late, contact them and say, "We see that your payment is overdue and we'd like to avoid having to charge the late fee. So, if you can let us know it's on its way this week, we will be happy to waive the fee this time." You'd be surprised how quickly people pay up! 4. Deliver your final invoice with the deliverables (or before). Once you wrap up a client's project and you are ready to deliver, make sure you include the invoice with the full package. Don't wait! If you wait, they may forget about the project or leave your invoice sitting in their inbox unpaid. After all, the most important thing to them is the actual deliverable. So, anything extra you send later may not get handled if they are wrapped up in other projects. If you are in an industry that frequently expects clients to put down a deposit or a retainer, then attach the final invoice with the deliverables to remind them of their balance or request the balance before the final files are delivered. A friend of mine who is a graphic designer does not release the final downloadable files she creates until the client has paid their balance. Decide what's best for you and your business, and be consistent! 5. Get to know your clients' AP department. Oftentimes your client's contact person is not the same person who signs checks or swipes the credit card to pay invoices. So, when you're setting up the project or service, ask your client if there is someone in their Accounts Payable (AP) department you should copy when you deliver the final invoice. Many times they will tell you, "No, I'll take care of sending it on for payment." This is fine... as long as they actually do. And if they don't? Some people simply forget to forward an invoice because they receive the deliverables and move on to their next task. If your client becomes unresponsive about an overdue payment, put in a quick and friendly call to their main business number and ask to speak to someone in AP. You'll often find these people to be very responsive, as they want to avoid paying a late fee. This also gives you a chance to get their contact information for the next time you send an invoice to the same client. Decide which of these items you can do today and which might take a little longer to get in place. Make a plan to knock out these 5 items within the next 30 days and you'll see your payments coming in even before they're due! Add some verbiage to your contract and invoice templates with your payment terms. Tip: make them bold. Decide on the terms of a late fee and add it to your contract and invoice templates near the payment terms. Add attaching your invoice with your final deliverables to your workflow. Create some "cut and paste" verbiage to start adding to your emails for when you set up a project and request information on who to copy in your client's AP department when delivering the final invoice. If you're anything like me, you don't always have time for traditional networking, i.e., taking time out of your hectic week to drive to an event, spend time talking to people who are usually unqualified leads and then following up with anyone who showed promise over email or phone later that week. It can also be exhausting to try to fit it all in. And while there's a lot to be said for meeting people in person, I believe we could be doing this more effectively, especially for those of us who aren't the best at the traditional way of networking or who have limited time for scheduling extra events in the middle of the week. And let's be honest, traditional ways of networking are not effective for everyone all the time. Sure, it's great to grow your network, but how many times have you gone to a networking event and felt like you didn't take away a single warm lead from it? Or how many times have you walked away with a few leads you felt were solid only to follow up with those leads and hear nothing but crickets? Well, I'm here to tell you that you don't have to know how to work a room to be an effective networker. You can still form and grow a solid network when you work from home, and you don't have to necessarily lose time commuting or gathering business cards to remember who to contact after an event. Here are my top 7 tips for effective networking when you work from home. 1. Make time for one-on-one meetings instead. You don't have to attend every in-person event near you in order to reach those in your local area. Instead, choose to set up one-on-one meetings and nix those large mixer events. Let the person know you'd like only an hour of their time, and make it clear what you plan to talk about so that you've also given that person the courtesy of feeling prepared. After all, it can be very draining to attend those large networking events. There are too many unknowns. A huge perk of networking in one-on-one scenarios is that if the other person agrees to meet, no one's time is wasted and you can make a more serious and effective connection. It will certainly be a more memorable one. And you can look up plenty of information about the other person and their business or organization in advance. This way, you can rule out some of those unknowns and show this person that you did your homework. Instead of trying to think of something intelligent to add to a conversation on the spot at a networking event, take the time to research leads/prospective clients and send them something that is worth their while. This should be something of interest to them that they would not normally be expecting from you. It could be an article you saw that might interest them, a blog post you wrote that applies to them and what they do, or even a handwritten note (major points here, as it's not that common anymore to send handwritten notes--people love them!). Do you sell a service that might help them in their day-to-day? Offer to give them a sample of your work that they can use free of charge. I'm not saying you should give away your work or time, but think of something unique that will make them want to keep talking to you. Whatever you choose to send, it ought to be something more memorable than just your business card. If you're really wanting to do business with someone, one of the best things you can do is follow them on social media and interact with them. Is your lead someone who posts regularly on a topic you are knowledgeable about? Take some time every day to work on your social media game. This includes interacting with others you follow and would like to do business with. You could even include them in one of your posts as a great shop, resource, role model, you name it. Whatever you do, give credit where credit is due and be as classy about it as possible. Also, check your "networking" posts and comments for punctuation errors, typos, etc. before you hit "publish". Even if you mean well, publicly misspelling the name or social media handle of someone you want to get to know better is not cool. 4. Send them a congratulatory note. A very kind way of networking with someone is to congratulate them when you see they've made an accomplishment, accepted a new position or recently celebrated a milestone. Don't take this moment to hock your services. Just say "congrats" and be personable. That's all. They'll remember you for it. 5. Meet online if you can't meet in person. While in-person meetings are ideal, technology allows us to "meet" with people we might not normally ever have the chance to sit down with. For example, just this week I had a virtual coffee meeting with someone in another state and another with a client in Europe. These are people who I would normally not have been able to sit down with as easily due to geographical challenges. Take advantage of the amazing and free technology out there and give it a go. You'll feel comfortable in your own space and there will be none of that first-time-meeting awkwardness that can sometimes come with meeting in person. You can still make a great connection and most likely have a more engaging conversation than you could at a large networking event. 6. Use your email list. Maybe you've heard this advice before, but use your email list. Seriously. Don't depend on the power of social media to do mass networking for you. As people say--and it's true--social media accounts are rented space. That's made obvious every single time Instagram (and other platforms) change algorithms. You have no idea if you're even showing up in your followers' feeds. But in people's inboxes? Now, that's a place you know you can show up. So, work on building your email list and use emails to network with current clients, leads and people who have similar interests. Set up an email capture of some sort on your website and start sending out emails to your list on a consistent basis. Provide them with valuable information that makes them excited to see your emails pop up in their inboxes. 7. Let your other social gatherings double as networking opportunities. Now, I'm not telling you to start handing out business cards at every social gathering you go to. But when the opportunity arises, be ready. For example, when I'm in public and I get asked about what I do, I've already got a brief elevator speech ready for anyone who might be a prospective client. And you better believe I have a business card or two in my bag should they ask me for more information. Be ready to meet people in unexpected places--airplanes, your child's soccer game, the public library, church events, wherever you spend your time that's not your home or office--because isn't that how things go? You never know who you'll meet or who you'll be standing next to when you're waiting in line somewhere. It's not strange. It's smart. Don't spend a lot of time talking about yourself, or this may come off as being too "salesy". Just give the person your information and request theirs as well. You can follow up with them later in a more appropriate way. There are so many ways to network that don't involve taking time away from your family in the evenings or losing large amounts of time from your workday. No more attending an event and leaving with a fistful of cards and knowing that only one or two of those people might be truly interested in what you do/sell. Think of some ways you can effectively communicate with your target audience that work for you and your lifestyle, schedule, etc. Be creative and think outside the box! People will remember you more for these things and your business cards won't end up in their trash can. Lastly, don't be afraid to set up a very limited number of meetings per week or month. For example, I only meet with people on Tuesdays and Thursdays for the most part. Stick to what works for you and what allows you to be effective in your business and grow at your own pace. For a very refreshing perspective on networking, let's consider Jackson Spalding's take on relationship building instead of traditional networking as well. "Networking is about meeting people. A big difference. Networking is a task while relationship building is a commitment. It’s more long term than short term, more quality of relationships than quantity. Networking can be superficial, while relationship building is always about professional and personal sincerity." So the next time you think about your need to network in order to grow your business, shift your mindset to how you can actually build relationships and invest in others. The returns will be much greater. For more strategies on networking from home, join me for How to Strategically Use LinkedIn to Grow Your Network and Business on March 21, 2019.